Like an apparent many other people, I was walking my local mall yesterday and was immediately drawn into Yankee Candle Company by the large store front display featuring the dancing bride and groom from their Boney Bunch Collection. Inside, I looked around, and found a number of candles, candle holders and other goodness that appealed to me- but no dancing couple. Not thinking much of it, I decided I'd check the company's website when I got home. Surely, I thought, I can grab a set of these guys off of eBay. However, a quick search finds that the cheapest available is a somewhat heafty $59.99, and there are a host of stories about people paying upwards of $150 a pop. So what is it, exactly, that makes this piece so appealing? Upon first glance, the two instantly reminded me of Tim Burton's "The Corpse Bride," but at the same time appeared to be something entirely new based off the ideas in the film. Personally, the dancing dead skeleton bride and groom gives an impression of a seemless, timeless union of vintage and new age Halloween decor. 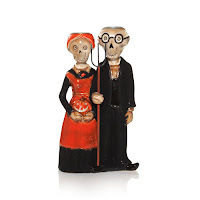 If you're finidng yourself disappointed and unable to pick up the groom and bride, there are plenty of other interesting pieces as part of the set, such as "The Boney Bunch Farmer and Wife Taper Holder."